Re-posting my review of this fantastic collection, in light of the Stoker Award it was given last night. Seriously, this collection rocks. You should read it. Quote: "There are cracks in the world. These cracks are inhabited by...marvels undreamt of in our philosophies." From the short story, "The Siphon." I've heard a lot about Laird Barron in various book groups to which I belong. 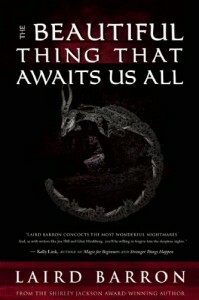 Most especially I hear from fans of Lovecraft that Barron is even better. I have to agree. Ever since I read "The Light is the Darkness" , (to see my review of it, just scroll down the book's page, it's the first one), I knew that I would be reading more of Barron's work. Last week I finally got the opportunity to do so, and I jumped on it. I couldn't be more pleased with that decision. I submit this quote: "The canopy of the trees across the street shushed in the breeze, and fields littered with pockets of light swept into the deeper gloom like the crown of a moonlit sea. The starry night was vast and chill, and Lancaster imagined entities concealed within its folds gazing hungrily upon the lights of the city, the warmth of its inhabitants." I won't go into a long winded soliloquy about each story, but I will briefly speak about the theme of this collection-cosmic horror- (see the quote above). Robert Chambers (The King in Yellow), Lovecraft and other authors created and loved this theme. I think it's exciting to see how Laird Barron makes it his own. The idea of ancient, alien invader Gods that live under the earth, under the sea, or somewhere in outer space is spooky by itself. To think that there are humans that live to serve them makes the whole idea even scarier. The cracks in the world mentioned above often serve as gateways...but for what is the question? I loved the ancient, evil magician Phil Wary, who appears in a few of the stories. I loved Phil's answer to the question, do you serve the devil? "The Lord of Flies is only one. There are others, greater and more powerful than he. Presences that command his own obedience. You've seen them. I showed you." I loved the hidden village deep in the forest, (and what was in that tree??!! ), in the story The Men From Porlock. I loved the mysterious, reclusive author Tom. L. in the last story. In short (too late! ), I loved every story in this collection, but most especially The Siphon and The Jaws of Saturn. Outstanding! I could go on for quite a while, but I am going to leave it off here. The Beautiful Thing That Awaits Us All is worthy of my highest recommendation. If these themes are even remotely attractive to you, get this book now. You won't regret it.